The public is invited to enjoy free food and music while celebrating and exploring the improvements at the Pacific View campus this Sunday afternoon, June 11, from 1pm to 4pm. 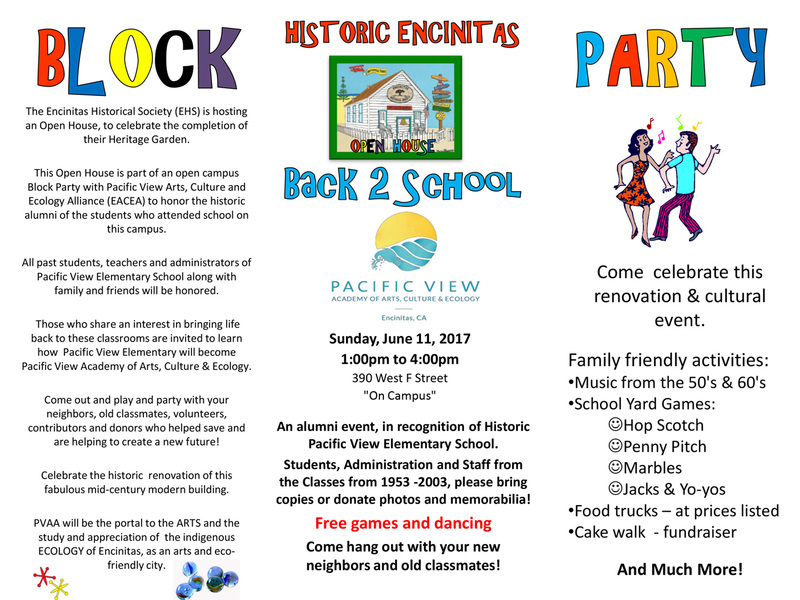 The Encinitas Historical Society and the Encinitas Arts, Culture and Ecology Alliance (EACEA) are co-hosting the Block Party, and they’re also encouraging Pacific View alumni to attend, bringing old photos and memorabilia. “This is the first time the entire community has been invited to visit Pacific View and get a close-up look at what has been done here since the City of Encinitas bought the property,” said Carolyn Cope, President of the Encinitas Historical Society. Cope said that the Historical Society’s Old Schoolhouse, the first school in Encinitas dating from 1883, will be open for visitors. The fence that once separated the schoolhouse from the rest of the Pacific View site is now gone and raised planters now adorn the nearby area. Food will be provided by Bull Taco, and the High Plains Drifters band will play. The Block Party is being underwritten by a $3500 grant from the County of San Diego. Visitors will be able to see firsthand the many improvements made since the site, which fell into disrepair after being shuttered for over 10 years, was purchased by the city in 2014, days before it was slated to be auctioned off to developers by the Encinitas Union School District. The non-profit EACEA, a group of local artists and other community members, is working toward establishing the Pacific View Academy of Arts, Culture and Ecology. They’re currently putting the finishing touches on details of an agreement with the city. 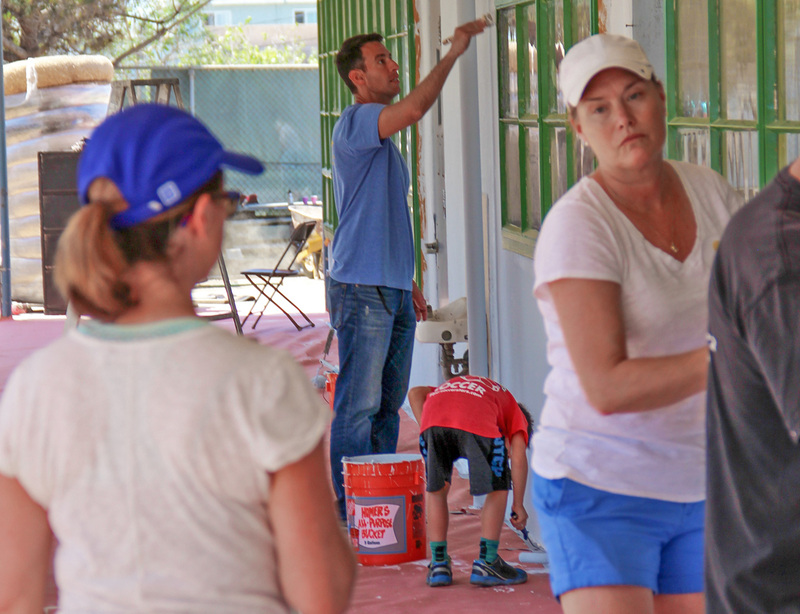 A major volunteer renovation event in late April, mainly fueled by dozens of volunteers from the North Coast Church of Vista as part of their Weekend of Service program, made a striking difference in the condition of the former elementary school. Monthly weekend volunteer renovation and cleanup events are also held. There will be a Pacific View information booth at the 13th Annual Switchfoot BRO-AM surf and music event at Moonlight Beach June 24. An informative email newsletter from EACEA that describes Pacific View’s progress and goals is now issued periodically. You can subscribe here. 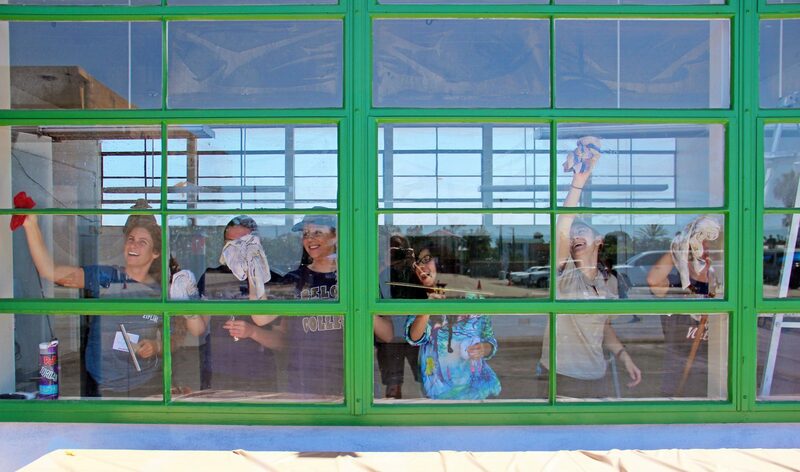 Volunteers at Pacific View’s recent Weekend Cleanup enthusiastically cleaned windows that hadn’t been touched in years. 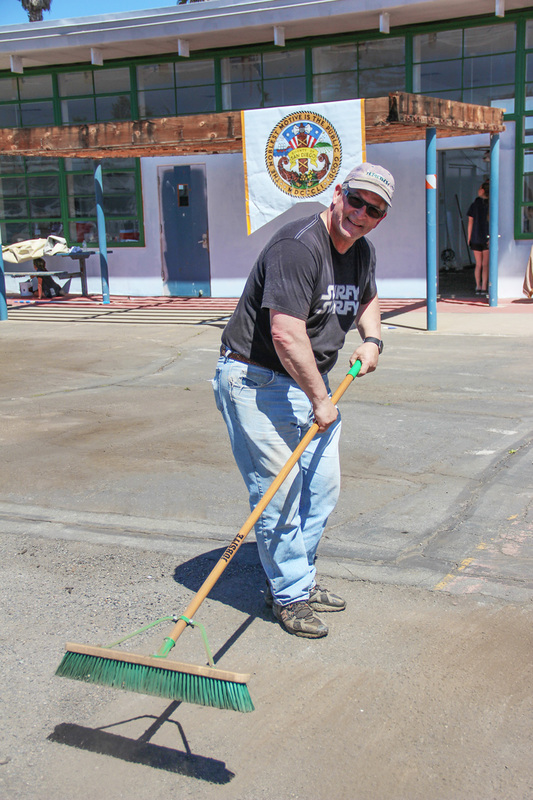 Encinitas Deputy Mayor Tony Kranz put his superior sweeping skills to work during the Weekend of Service volunteer event. Tony’s vision and efforts were instrumental in navigating the city’s purchase of the historic Pacific View site. North Coast Church member Rebecca Fink and her daughter Gemma distributed snacks to volunteers who were too busy to take a break. Encinitas’ newest Encinitas City Council Member Joe Mosca and his son Devan worked to help repaint the old administration building on the southeast side of the campus. 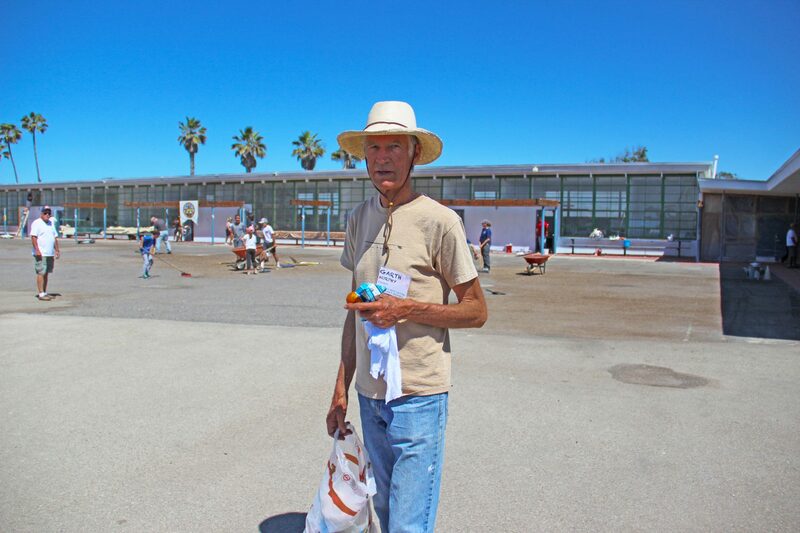 EACEA President Garth Murphy’s decades of experience restoring historical buildings has come in very handy during Pacific View’s resurrection. He also owns the Derby House on Vulcan Avenue, the oldest home in Encinitas.